Relational databases are data stores whose structure is based on how items of data are related to each other. A key benefit to taking a relational view of data is to reduce duplication. For example, you might want to record data about people in a town. If you took a non-relational approach to recording this data, you would store the person's name together with their address, place of work, school and so on as individual data items. Where multiple people live at the same address or go to the same school, you would record the address or school details in multiple places. If the school name ever changed, you would have to update it in every data item in which it appeared, which is a time-consuming and error-prone task. In a relational database, each entity such as the person, the school, the place of work is stored in separate tables and unique instances if the entity are identified by a Primary Key value. Relationships or associations between entities are defined in a database by the existence of Foreign Keys. Each table has a Primary Key (PK) that uniquely defines each instance of an entity (or row) within the table. The Books table's PK is BookId, and the Authors table's PK is AuthorId. 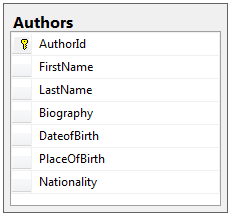 The AuthorId column in the Books table is a Foreign Key (FK), linking a book to its author. Book is the dependent entity in the relationship. It's integrity depends on a valid reference to an author. Author becomes the principal entity. Using foreign keys, you can link one author row in the database to many book rows. This type of relationship is the most commonly found and is known as a One-To-Many relationship. Depending on the diagramming software that you use, the side of the relationship that has a multiplicity of 1 is normally depicted by a figure 1 or a key. The side of the relationship with a multiplicity of many is usually depicted by an asterisk (*) or an infinity symbol (∞). Multiplicity describes the potential number of items that can be found at one end of a relationship. Both classes contain properties whose types can be mapped to existing database types - int, string but they also contain properties that cannot be mapped. There is no equivalent type in databases for the Book type or the Author type. Therefore they are viewed as navigation properties. The definition of the Book class allows each book to have at most one author through the Author navigation property (a Reference navigation property having a multiplicity of zero or one), and the definition of the Author class allows each author to have many books through the Books navigation property (a Collection navigation property having a multiplicity of many). Together, they define a one-to-many relationship. The principal entity in a one-to-many relationship is the one that has the collection navigation property, and the dependent entity is the one with the reference navigation property. The second most common type of relationship is known as a Many To Many relationship. The following diagram shows how this appears in a database diagram. Note: While in previous versions of EF, this approach was sufficient to have EF generate the appropriate tables and form the correct relationships, in EF Core 1.0, it isn't. 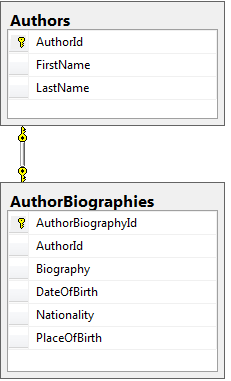 It is necessary to include an entity within the model to represent the join table. In this example of a one-to-one relationship, each Author can have one, and only one biography. One reason for implementing this kind of relationship is when you are working with inheritance. For example, you may have a Vehicle entity, with sub classes such as Car, Truck, Motorcycle etc. Other reasons include database design and/or efficiency. For example, you may want to apply extra database security to the dependent table because it contains confidential information (an employee's health record, for example), or you just want to move data that isn't referenced very often into a separate table to improve search and retrieval times for data that is used all the time.